This is a real treat and a great summer refresher that everyone is sure to love. 1 bottle of your favorite plain vinaigrette salad dressing (just the standard vinegar, oil and mixed seasonings) We like Newman's Own. Core all the strawberries, and place them aside. Place salad dressing into blender and put about eight of them in the blender and blend for about 20 seconds. Place about half of the sugar into the blender and blend for another 20 seconds and taste test. Repeat the last step until it is sufficiently sweet. 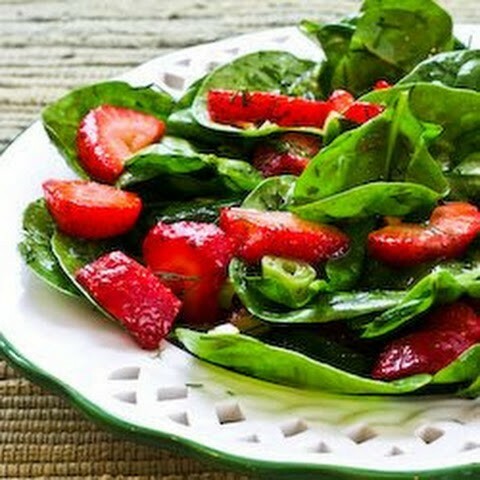 Place salad into salad bowl and slice the remaining strawberries in with the the salad. Toss and refrigerate both the salad and the dressing for at least 1 hour prior to serving.